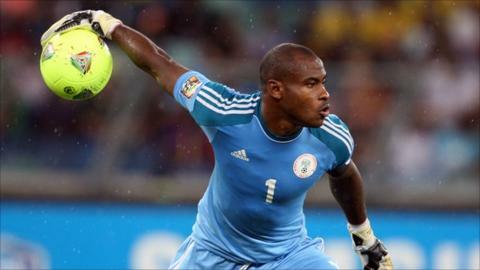 Nigeria goalkeeper Vincent Enyeama has spoken of his desire to make his stay at French club Lille a "long" one. Enyeama was handed a two-year contract extension on Monday after a brilliant run that saw him keep 11 consecutive clean sheets. Aware of envious glances from rival clubs, Lille immediately moved to secure his future by extending his contract to 2017. The 31-year-old shot stopper's previous deal was due to expire in 2015. "I'm very happy to be part of this team and that's why I was happy to commit to a new contract," said Enyeama, who captained the Super Eagles to the Africa Cup of Nations title in February this year. "From what I've experienced with this talented team this season, the reasonable thing to do is to make it a long stay. "I love my team-mates, officials and our fans have made me feel at home." Enyeama has been Nigeria's number one since the 2002 World Cup, but remains one of the game's most underrated goalkeepers. But after being installed as Lille's first choice goalkeeper by Rene Girard, he now finds himself on the radars of some of Europe's top clubs. An own goal against Bordeaux last Sunday was the first time he had conceded in 1,062 minutes of football. It ended his chances of breaking Gaetan Huard's Ligue 1 record of 1,176 minutes without picking a ball from his own net. Enyeama told BBC Sport that he is "relieved" that the attention is no longer on his clean sheet exploits. "It was going to come and now I hope everyone can start talking about the great work the team is doing in France. "We've been on a great run and hope to continue that because this team is blessed with great professionals. "The target has always been and still is to compete and hopefully win the title. Nothing is impossible."